This is a medium-sized update which contains a lot of packages rebuilt for the new version of libidn2. Some packages may have been missed so please report any which you find. Also of note is systemd 242 and Xorg. While the update worked without reported issues for others I'd still recommend switching to a TTY for the update, just in case. Otherwise, running an update with pacman from within a screen (or tmux or byobu) session should also work fine. Finally, this set of updates will reset your Xfce wallpaper/background. I don't know why (it happened in x86_64 too) but it didn't seem like that big of an issue to worry about too much. You can just re-set your wallpaper as normal. Other more standard updates to things like Palemoon and Firefox. If you find manjaro32 useful please consider donating to, or helping out with, archlinux32. It's a small team taking on a huge project and any help will no doubt be very much appreciated. Why aren't the available packages/package versions the same as x86_64? archlinux32 packages are based on Arch packages but may need editing to build correctly. Builds of less-popular packages are lower priority. 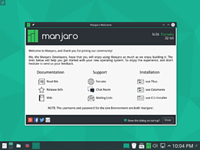 Using manjaro32 and spotted an out-of-date Manjaro package? First, check the Manjaro GitHub sources for core, extra, and community. If it’s in the GitHub sources, it’s a Manjaro package. You can check whether the package is in the archlinux32 package list to see whether the package is one built by archlinux32. If it’s a Manjaro package, and it’s out-of-date, report here. I'm only packaging current LTS kernels. Any marked as EOL are dropped. I'll not be building the mainline kernel. I cannot guarantee timely security updates on x32-stable. If this is critical for you I recommend you switch to x32-testing or cherry-pick those packages from x32-testing or x32-unstable as they become available. Something broke. Isn't this meant to be stable? "Stable" means "infrequently changing", not "everything will work perfectly all the time". If you want it to mean everything works, you need to help test the things you're interested in. What about x32-testing and x32-unstable? These are already available, and I recommend you use x32-testing if you can to make sure testing is done. x32-unstable should be used by anyone who wants to try and find any issues before they impact other people. If you have multiple/many machines you really should run one of those on x32-unstable. Yes. Just set it again. Update on 1 System and 1 VB without Problems.